Star Wars Battlefront is mostly about playing the extras in those grand battle scenes from the films. But grab one of the Hero pickups, and for a short time you can play as one of the series’ best-loved characters. Both the Rebels and the Empire have three trump cards each, and all offer unique approaches to turning the tide of battle. In the mood for more Jedi action? Check out our list of the best Star Wars games. If you’re looking for a bit of a quick education in what skills these heroes and villains bring to the Battlefront table, and how to use them, then let us be your guide. We’re no Master Yoda, but help you out with a basic certificate in Battlefront Heroes proficiency, we can. Force Push: Sends out blast of force energy, pushing enemies back from you. Saber Rush: Propels you forward with high speed for a quick lightsaber strike. Heavy Attack: A wide-sweeping strong lightsaber swing. 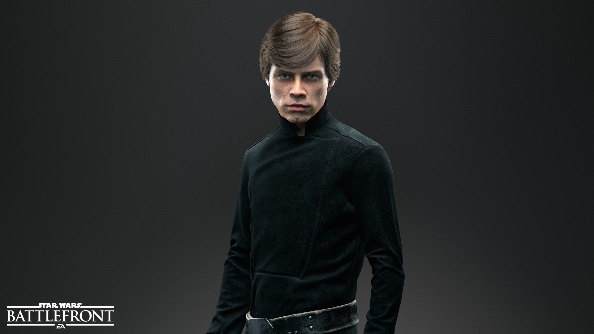 Armed with his lightsaber and the power of the force, Luke is a close-combat fighter, so you’ll need to get personal. Saber Rush can help you quickly approach and strike distant targets. Luke can jump fast and high thanks to his Force training, so when closing in on enemies you can hop away from incoming explosives and deflect lasers with your saber. When in striking range, Heavy Attack can take out multiple foes at a time, while Force Push sends crowds flying. Rapid Fire: Allows you to fire your blaster as fast as you can pull the trigger with no overheating for a short period. Lucky Shot: A powerful charge-up shot that can disable vehicles and even break through a lightsaber block. Shoulder Charge: A quick run forward, which can be used offensively to ram opponents, or defensively to escape a fight. 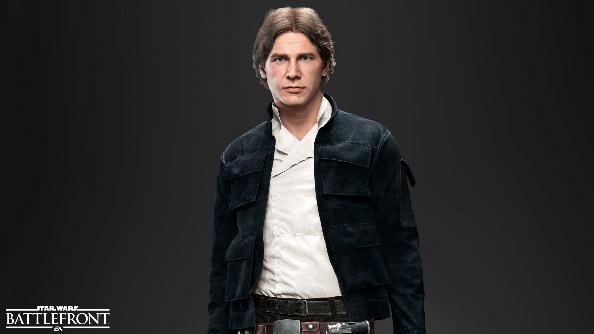 Han Solo has been designed as a bit of a lone wolf, with a collection of both close and ranged attacks to make him pretty versatile. He’s quick on his feet, with a charge attack to get in close, and a combat roll to dive out the way of danger. Armed with a blaster to take out foes from range, Han can even shoot through Vader’s lightsaber blocks with his Lucky Shot. That’s not all that skill is useful for though. Suffering from a pesky Boba Fett? Use Lucky Shot to snipe him out of the sky, and then Rapid Fire to finish him off. Trooper Bane: A single-burst of laser fire that kills Stormtroopers in a single hit, and will damage and stun Villain characters. Enhanced Squad Shield: Like the regular Squad Shield, but boosted to protect against some Force abilities. You can also shoot out from it if using Trooper Bane. Supply Drop: Drops power ups onto the map for other players to use, and health boosts for other Heroes. 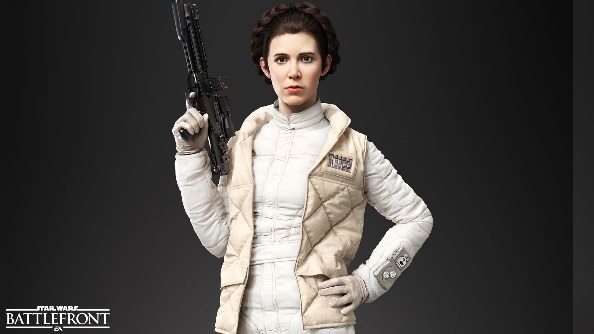 Princess Leia is the Rebels’ support character, helping buff both other heroes and the ground troops on the field. Her Supply Drop will keep players topped up with special abilities, and anyone who spawns on her will appear as Alderaan Honor Guards. She’s best used in a defensive position to hold ground: use that Enhanced Squad Shield to keep players protected by objectives, and then use Trooper Bane to make Leia’s offensive abilities that much more powerful. Force Choke: Picks up an enemy with the power of the force and strangles them until dead. Saber Throw: Throws your lightsaber in a straight line, spinning through foes and then returning to your hand. Heavy Attack: A forceful hand-to-hand attack with your lightsaber. 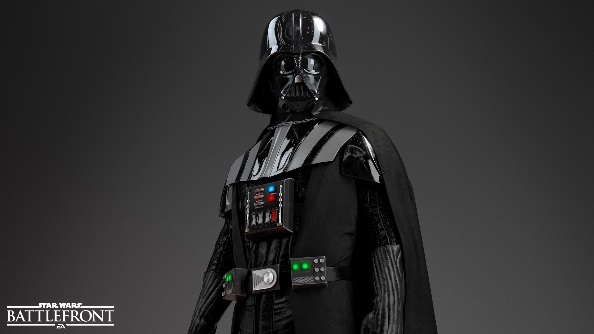 Vader’s iconic Force Choke can be used from a fair distance, and can even grab multiple enemies at once. He’s also able to hurl his lightsaber at ground troops and even at incoming air vehicles, making him a surprisingly good ranged villain. Up close with enemies soldiers, the heavy attack will cut them down with no trouble at all. 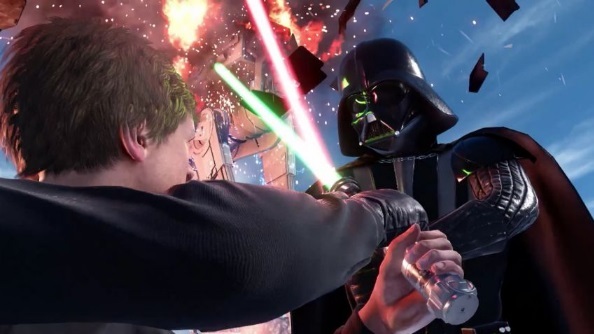 When fighting against Luke, if both of you use Heavy Attack simultaneously, you’ll lock lightsabers for a duel. Handy if you wanted to add even more epic moments to a massive 40-player battle. Force Dash: An extremely fast dash in the direction you are currently moving. Imperial Resources: Drops power ups onto the map for other players to use, and health boosts for other Villains. Force Lightning: Shocks enemies with bolts of lightning. Can also be used as an area-of-effect skill with the more powerful Chain Lightning form. 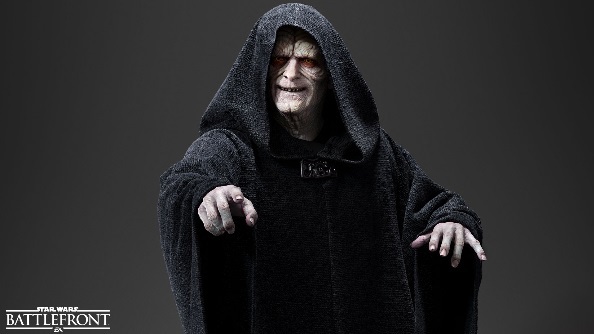 The Emperor is the Empire’s parallel to Leia, in that he’s a very capable support character. Players spawning on him appear as Shock Troopers, and he can create buff tokens for others to pick up. His other abilities are very offensive though, with Chain Lightning bringing effective destruction to big crowds. Using Palpatine is about mastering both elements, and remembering not to just focus on frying everything that moves. Combining attacks with Force Dash makes The Emperor an excellent hit-and-run character. Jetpack: Allows you to fly around the map. Unlike the ground trooper’s jump pack, Boba’s jetpack allows proper flight rather than extended leaps. It is limited by a fuel cool-down gauge. Rocket Launcher: A wrist-mounted rocket launcher for explosive damage. Flame Blast: A wrist-mounted flamethrower to burn close-range enemies with. 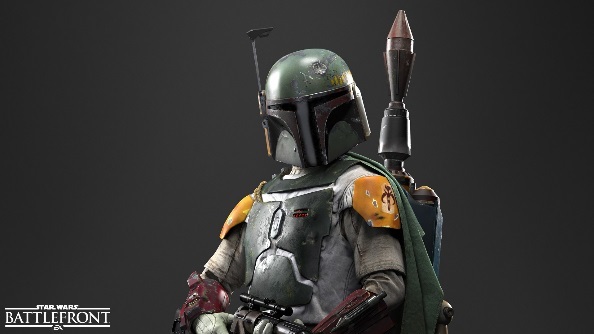 The most mobile character in Battlefront thanks to his jetpack, Boba Fett can skim across the map and take shots from the sky with his EE-3 rifle. He’s an entirely ranged character, so that speedy jetpack will keep you out of trouble with the likes of Luke who can only play hand-to-hand. Be mindful of your jetpack’s fuel though: you can’t stay up in the sky forever. Fett’s gadgets are useful for getting yourself out of a tangle. If there’s a bunch of rebels on their way, use the Rocket Launcher for a big blast of damage. And if they’re already on top of you, the Flame Blast is a hot and deadly close-quarters solution.